It goes without saying that the suit is the cornerstone of a man’s wardrobe. It is the staple item that is intended to be perennial, a go-to for all dressed-up occasions, and even a daily exploit for the savvy businessman. What a suit can be and often is, for most of the male population, is banal. Sarah Burton’s Alexander McQueen has had a crafty hand in revitalizing the suit, not through exaggerated proportions or unconventional materials, but by way of dialogue instigating prints. 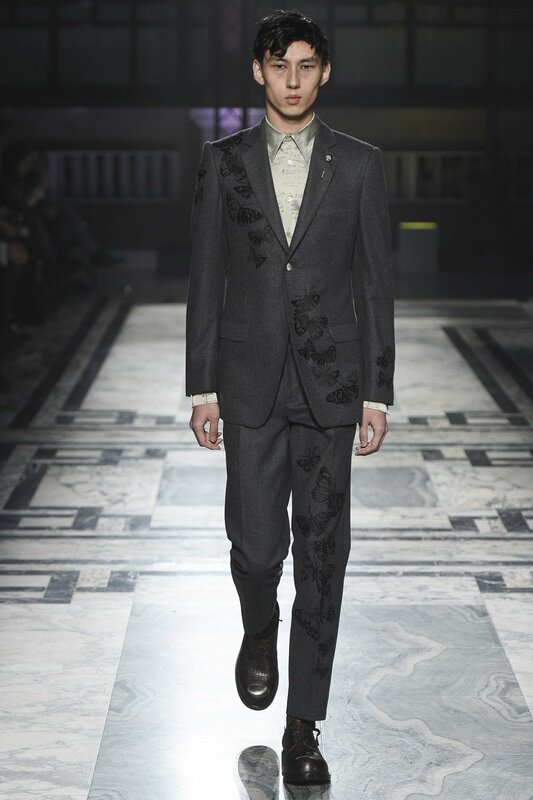 The use of prints or even tonal textures, which at McQueen is usually in very classic colors such as navy, gray and black, is an approachable way to amplify the oomph factor when delving in suiting. If one is looking to retain the immortal conventions of men’s style but in an updated manner, this could be a viable starting point. Style Advice: Maybe you are not quite ready to make a bold print statement just yet. Maybe you never will be, but you do understand the value in modernizing your business casual repertoire. Not to worry, there are ways to ease into the updated suit. A pattern that rides along the line of conservative and outlandish is the checked pattern. The check pattern is the traditional way to infuse a bit more drama and edge into a man’s wardrobe. How pronounced or faint the check appears on the suit varies in degrees, and is contingent on the level of risk the man wearing it is willing to take. If we are modeling a silhouette on Alexander McQueen then it becomes integral that the check is more noticeable and bit bolder than tradition allows. This Navy frock from Ted Baker is a snazzy way to start. Don’t let the prints stop with the suit, furnish the look in pattern as well. Tuck this Ted Baker jacquard print shirt underneath. Bring it all to a finely curated close with these suede numbers from Suit Supply. There you have your first foray into updating your suit selection. Must-Have: Talk about banal. This undoubtedly already owned item is in dire need of an update. Don’t just rely on the traditional oxford shirt to get you through all sartorial scenarios. 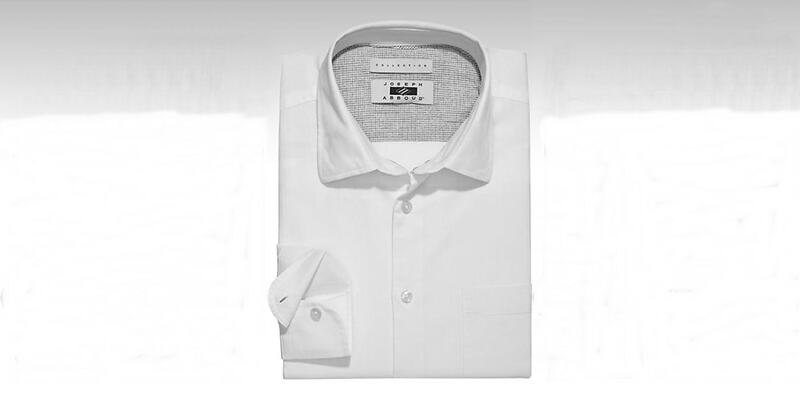 Explore the vast world of the crisp white shirt. Maybe you can find one in a faintly flowing style or in a textured herringbone. No matter how you decide to edge up this wardrobe classic, it certainly needs a revamp. A tenet of great style in the 21st century is taking tradition and spinning it on its head. So go ahead and engage in the new crux of good fashion for men: risk taking. Industry Update: On the same note of McQueen’s printed suiting are brands hailing from Sub-Saharan Africa. Challenging the notions of masculinity in clothing is a motif that has been beautifully embraced in the world of menswear. Everything from silhouettes to colors to use of patterns and choice of materials, gender obsolescence has integrated into the men’s clothing market. The west, east and southern parts of Africa have caught on and are making big waves on the global fashion landscape. Two brands of high note are Orange Culture and Dent De Man. The latter has become a mainstay at the Pitti Uomo trade shows in Florence, Italy, and the former will be showing at this summer’s London Fashion Week Men’s. The primary point here is that brands like Orange Culture and Dent De Man are making waves in the global marketplace. What this poses to do is to not only normalize the image of African men and their unique aesthetics in fashion, but it also potentially provides a new stream of capital to the continent of Africa through the fashion industry. The momentum being built around culture and design in Sub-Saharan Africa can best be defined by the mantra, watch this space! Sag Awards: The men on the red carpet of the Sag Awards kept it classic, uninteresting and uninspiring. For most of the gentlemen who walked the carpet for the press, the distinction between best and worst was fit. Stand outs like Trevonté Rhodes (who continues to show us how a stocky guy can get fly), Riz Ahmed, Michiel Huisman’s velvet moment, Matt Smith’s double breasted retreat, Levi Meaden’s navy number, Glen Powell’s effortless suave, or Jonah Hill’s body con tailoring, were all guided by an attention to how the garments on their backs fit them. Well. It fit them well. The wanna-be dapper dudes who fell through the cracks seemed to be style illiterate, fit insufficient or just too boring to mention. The men of Hollywood need to understand that menswear is having its biggest moment since the days of Bowie, Jimi Hendrix, Michael Jackson or Prince. This is the time to put your best suit forward and make it count. The only man who did that on Sunday night was Mr. Nobody himself, Rami Malek. The patterned grey suit, the black tie on black shirt, and the patent leather oxfords, came together for this certified head to toe appearance. This is the blueprint, the only blueprint, that needs to be featured, studied and retained for all men. This is how you own a red carpet. Not a hair out of place, and with a masculine edge intact. Is it too early to give Mr. Malek best dressed of the year? I have a feeling it won’t get much better than this. Unless he gives us another stand out moment. We will certainly be tuning in!